Russia's consumer price inflation hit 15 percent in annual terms in January, on the back of the sharp decline in oil prices last fall and the consequent collapse of the Russian ruble in December. Future fluctuations in the inflation rate are likely to depend on the political settlement of the Ukrainian crisis. In January, Russia's consumer price inflation amounted to a massive 15 percent in annual terms, according to statistical data published by the Ministry for Economic Development. 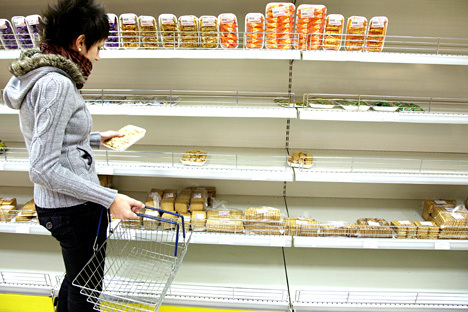 According to the ministry, prices rose by 3.9 percent in January 2015, the highest level since February 1999, the peak of the last economic crisis in Russia. "Usually, galloping inflation means a growth in prices by 10-100 percent in annual terms, and Russia's economy has been in such a state since late last year. The growth in prices is being driven by food inflation," said Timur Nigmatullin, a financial analyst at the Finam investment holding. According to the Ministry for Economic Development, the weakening of the ruble as a result of the drop in oil prices contributed to the acceleration of inflation. The ministry predicts that inflation will peak at 17-17.5 percent at the end of the second quarter of 2015. However, initially the Ministry proceeded from the assumption that inflation would not exceed 14 percent in January 2015. With the new data available, inflation in January in annual terms may be even higher. According to the Ministry of Economy, in January 2015 the price of food increased most of all – by 3.2 percent, while the prices for non-foods rose by 3.2 percent and for services by 2.2 percent. "Such a high level of inflationary pressure has not been observed in recent years. Such a hike in consumer prices is easily explainable by the sharp decline in oil prices and the weakening of the Russian currency by almost half," said Alexei Kozlov, chief analyst at UFS IC. According to him, the situation on the currency markets has gradually stabilized, while oil prices stand a good chance to restore some of the lost positions, which may have a positive impact on consumer prices. According to the analyst, the temptation to make far-reaching conclusions based on the results of just one month should be resisted, because the inflation rate may decrease in the following months. According to the forecasts of UFS IC, consumer price inflation for the current year will be about 10-12 percent. As Central Bank chief Elvira Nabiullina stated in an interview with Bloomberg Television, following the unexpectedly strong surge in January, inflation will continue to accelerate for some time and reach a peak in the second quarter, but then begin to decline. According to Nabiullina, the acceleration of inflation was caused by events that have already taken place, and there are no new foundations for a rapid growth in consumer prices. Nabiullina’s forecast is echoed by Timur Nigmatullin, who says the shock of the twofold devaluation of the ruble and the ban on many food imports from the EU introduced in August 2014 will not begin to subside until the end of the second quarter of 2015. At the same time, various factors may lead to the growth of prices in the near future, said Gleb Zadoya, head of the Profit Group's analysis department. These include another drop in oil prices and further devaluation of the ruble in the event of the imposition of the new round of sanctions that the West is threatening to impose on Russia if the conflict is not resolved in Ukraine. Russians have already identified inflation as a major problem. According to a study by the Russian sociological organization Public Opinion Foundation, Russians are worried most of all about the situation in the economy (23 per cent), high inflation and rising prices (22 percent). Every tenth Russian citizen mentions low salaries and a low standard of living, while another 10 percent are concerned about unemployment. In turn, 8 percent cite the country's economic dependence on natural resources, primarily oil exports, as a pressing issue.